Shethar “Duke” Davis, 95, Wabash, passed away peacefully in his sleep on Thursday, March 21, 2019, at his home. He was born Aug. 25, 1923, in San Diego, Calif., to Louis P. and Edna (Shethar) Davis. He spent a good part of his boyhood growing up in Switzerland, where he learned to speak French fluently and to master skiing. Duke graduated from the U.S. Naval Academy, Class of 1945, and served in the Pacific during World War II as a lieutenant on the USS Yarnall, DD-541, and the USS Maddox, DD-731. He was aboard the fleet of ships that sailed into Tokyo Harbor in 1945 for the signing of the Japanese surrender. After the war, he became an electrical engineer for General Electric in Schenectady, N.Y., where he met and married Jane Barstow on Sept. 13, 1952. They moved to Wabash in 1963 from Birmingham, Mich. Jane passed away Jan. 4, 2001. Duke was the president of Wabash Instrument Corporation, Wabash, for 53 years. Also known as WINSCO, they designed and manufactured science education equipment for physics and chemistry classrooms and labs throughout the United States and worldwide. Many WINSCO products are considered the gold standard for their respective categories. 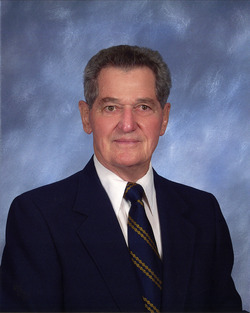 He was a member of the Wabash Presbyterian Church since 1963, a longtime member of the Wabash Rotary Club, the Elks Club, the YMCA and a member of the former Wabash Country Club where he served on the board of directors for a number of years. He was an avid reader, and spent his life never tiring of learning. Duke led a lifestyle filled with fitness and activity. In his earlier years, he loved to play golf, tennis, racquetball and handball, as well as running. In his later years, he took up swimming and competed in the 2014 National Senior Games in Cleveland, winning silver and bronze medals in freestyle swimming. In 2015, he was inducted into the Naval Academy Athletic Hall of Fame for gymnastics, class of 1945. Duke had a very loving family, and is survived by two daughters: Susan (Matt) Lambert, Boulder, Co., and Ellen (Rick) Porter, Wabash; four grandchildren: Garrett Porter, Marion, Matthew Porter and Haley Porter, both of Wabash, and Thomas Lambert, Boulder; and his brother: Thomas (Camille) Davis. He was predeceased by two older brothers, George J. Davis and Louis P. Davis Jr. He was also predeceased by his son, Louis P. Davis III. He is also survived by a number of nieces and nephews and their children. Funeral services will be 1 p.m. Thursday, March 28, 2019, at Grandstaff-Hentgen Funeral Service, 1241 Manchester Ave., Wabash. Friends may call from 5-7 p.m. Wednesday, March 27, and one hour prior to the service Thursday, at the same address. Preferred memorials are the Wabash Presbyterian Church, the Wabash Rotary Club or the Wabash County YMCA. The memorial guest book for Duke may be signed at www.grandstaff-hentgen.com.